Have an experience you’d like to share, an opinion you’d like to voice, or an event you want to publicize? We welcome suggestions and contributions to this Web site. Contact jillhomer (at) gmail.com for more information. Mark Your Calendars — Share the details of interesting new events, such a new ultramarathons or bikepacking races. Please include information about the date, course, and registration. Race Reports — Recount your personal experience in an endurance race. Profiles — Know an interesting person in the endurance community? Let us know. We welcome interviews and suggestions. Gear Reviews — We’re looking for suggestions and recommendations for outdoor gear that is unique or most useful to endurance and adventure racers. We do accept items for review. Please contact us by e-mail first to ensure it fits the focus of this Web site. Book and Film Reviews — Have you read or written a good adventure book recently? Or watched a compelling film? Consider submitting a review. 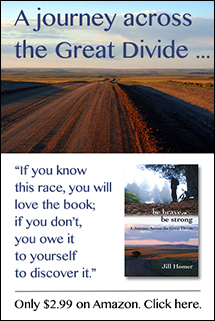 We’re also accepting adventure and endurance sports nonfiction for review. Please contact jillhomer (at) gmail.com for information about where to submit review copies. Kindle format is preferred. Do-It-Yourself — Have you created an awesome piece of gear that you’d like to share? We want to see it. Press Releases — Help keep our readers up to date on the latest developments. We accept press releases by e-mail and mail. Please contact us by e-mail for more information.